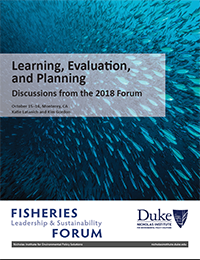 The 2018 Forum was the 16th and final forum hosted by the Fisheries Leadership & Sustainability Forum. From 2008–2018 the Fisheries Forum convened a series of forums for council members, council staff, and National Oceanic and Atmospheric Administration Fisheries staff. Each forum focused on a topic with regional and national relevance. The forums were a unique opportunity for managers to explore emerging issues and questions and to share ideas and information across management regions.